Home › Press and Insight › What are the characteristics of good quality feedback and criticism? Few people enjoy being criticised. Yet constructive, carefully-phrased criticism is a potent tool. Organisations that foster a culture of constructive criticism find that their teams perform more strongly. Individuals who seek out criticism and feedback about themselves learn more quickly and find themselves able to do their jobs more successfully. 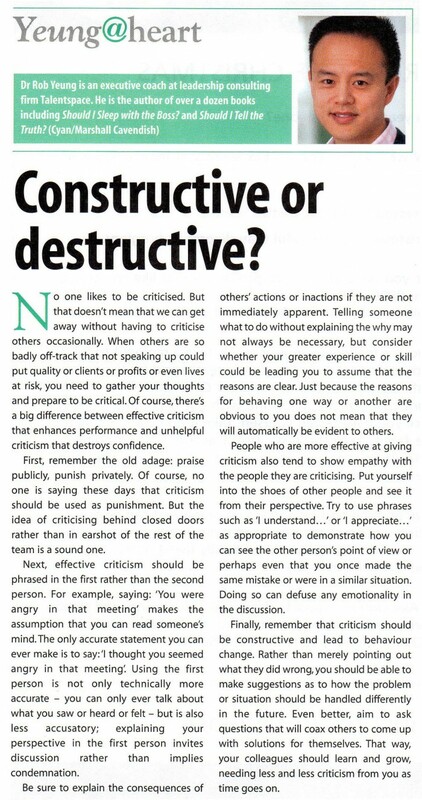 This article taken from a professional services magazine outlines briefly some of the key characteristics of good quality criticism.